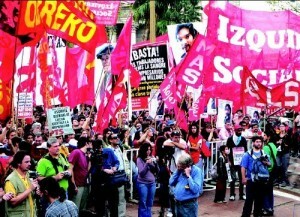 With immense joy we welcomed the creation of the newly formed Left Front (FRENTE de IZQUIERDA y de los TRABAJADORES) in Argentina. In April, three revolutionary organizations took this bold step: Workers Party (PO), Socialist Workers’ Party (PTS) and Socialist Left (IS). We salute our comrades from UIT-CI and other groups who rose to the occasion by putting aside programmatic differences to unite as one. In fact, this important effort by the Argentinian left puts a plus where there was a minus and represents, without doubt, a step forward for workers who always push for the widest unity in action to defend their gains. The Left Front is a new electoral alternative to the neoliberal government of President Cristina Kirchner who claims to govern for the people while paying the foreign debt. Ultimately, the decision to work together will benefit the fight for democratic reforms and socialism. Incidentally, the Front came together as a result of exclusionary electoral laws that require left wing organizations to collect thousands of signatures in order to run candidates. It is our hope that the formation of the Left Front will inspire revolutionaries in North America and elsewhere to begin to hash out their political differences and work together as one mighty fist that can withstand the attacks from above.